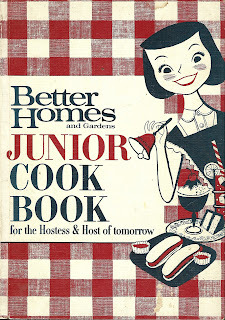 The Junior Cook Books are among the most popular vintage cookbooks to collect. I think many people have fond memories of making things from them. Also, they are charming. 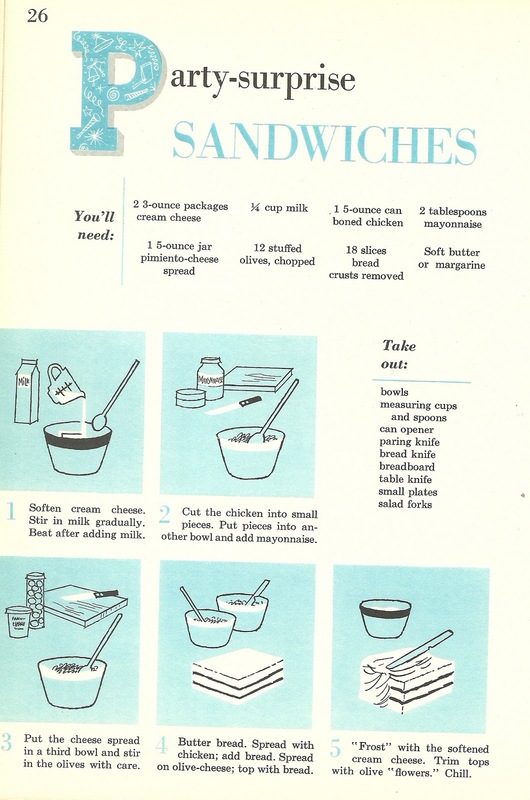 Mostly the recipes are simple and refer to delightful parties or events young people might participate in. 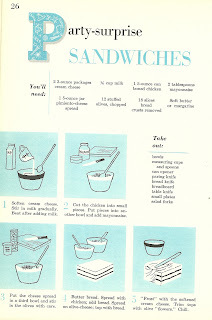 I have a few versions of cook books for young chefs, and I do also have fun memories of making some of the things with my sister. However, I was a bit surprised to see a Sandwich Loaf recipe for kids in this 1963 version of the Better Homes Junior Cook Book. It certainly would be a surprise to come to a party and be served this. I wonder what age would think this is a treat. They pop up everywhere!! But you're right…. not what I'd expect in a junior chef's book! My boyfriend loves pimento cheese spread. He's trying to get me to make it, but so far I've gotten out of it. I did find a tub in Walmart once, but it was not up to his pimento cheese standards. Where does one get the good stuff? Easiest recipe in the world to make chop the olives in a medium bowl then add a pkg of room temperature Philadelphia Cream Cheese and blend with a fork till completely blended. Place in a pretty dish and put un the center of a plate and serve with crackers and the like. When I bring this to a pot luck it vanishes everytime!